Jesus saw some rich people putting their gifts for God into the temple money box. Then Jesus saw a poor widow. She put two small copper coins into the box. Jesus said, "I tell you the truth. This poor widow gave only two small coins. But she really gave more than all those rich people. The rich people have plenty; they gave only what they did not need. This woman is very poor. But she gave all she had. And she needed that money to help her live." If we are not careful, we can easily jump to judgement based on external demonstrations of piety. We can very easily reach the point where we honor those with money because their gifts are large monetarily even though their sacrifices may be small in terms of actual personal sacrifice. 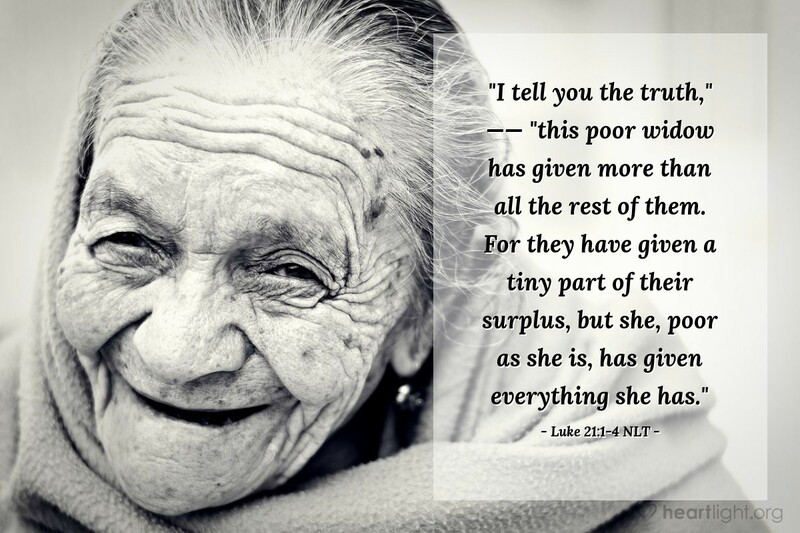 God, however, knows our hearts when we give. He knows what we hold back and why. He also knows how much we sacrifice and the attitude which has prompted that sacrifice. All around us are people who are living for the Lord, but who would seldom receive human recognition. Jesus, however, notices. He knows people's hearts as they give. Not one kindness we do in the name of Jesus and for the glory of people and Kingdom will be forgotten. Not one sacrifice for the Savior will go unnoticed. He knows the truth behind our gifts and is blessed when they come from a generous, joyous, and sacrificial heart. Father God, you own everything in the heavens and on the earth; please break me from the sinful habits of greed, worldliness, covetousness, and indiscipline. What your Son has done for me is much greater than any of my fleeting and temporary accomplishments. In Jesus' name. Amen.